I've register to http://www.gov.my/ and received confirmation email and link after JPN verified my name and ic numbers in 24 hours. 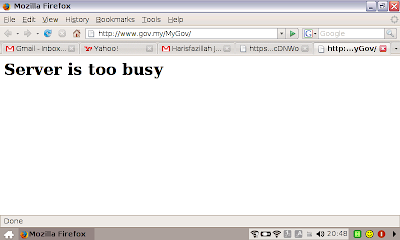 It's Sunday and around 20:40 when http://www.gov.my/ display Server is too busy. 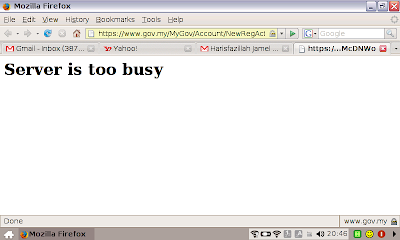 They can learn from Ministry of Finance regarding busy website and how to handle it. I tried accessing http://www.gov.my/ using CoralCDN. http://www.coralcdn.org/ or CoralCDN link http://www.gov.my.nyud.net/MyGov/ but not available.